Amherst has been made up of many different villages and neighborhoods. Here is a list of various neighborhoods that have existed over the years — some may be familiar and some may not. The northeast section was once known as the "Flat Hills," as it was in 1738. "Broad Gutter," as a local name in the northern part of town, has been forgotten. The name of "Factory Hollow" at North Amherst developed fairly early and reflects that community's manufacturing past. The common at South Amherst has been known for many years as "Fiddler's Green," but even by the late 1800s people had forgotten the exact origin. The section now known as "Mill Valley" was formerly called "Clark's Mills" and at a later date "Mill Hollow." The Nutting family living in the southeast part of the town originated the name of "Nuttingville." In the early 1800s contentions between the East and West villages (Amherst center was known as the West Village for a long time) caused Amherst Center to derisively call East Village "Sodom," while they claimed the nickname of "Mt. Zion." "Hawley Swamp" in the eastern part of the town derives its name from the Hawley family. Kellogg's tool factory gave the name of "Kelloggville" to the thriving settlement about it. The woodland near the Hadley line has long been known as the "West woods." "Pine Hill" is on the Bay road near Hadley line. 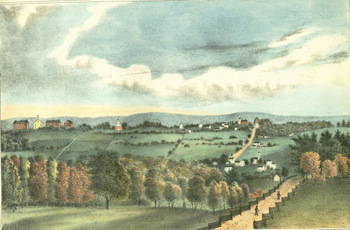 "Yale Hollow" and "Bartlett's Hollow" were located on Amherst's southern border with the Holyoke Range. The "Devil's Garden" on the mountain road to South Hadley was a boulder-strewn hillside. "Irish Hill'' was the nickname for the hill on East Pleasant Street just north of the University Lodge. The "Patch" meant the few homes west of the bridge and the old dam site off Leverett Road. The "Curry (Curragh)" was an area west of Sunset Avenue that currently hosts the Southwest Residential area at the University of Massachusetts. "Blackbird's Island" is another local neighborhood whose location is lost. Carpenter, Edward Wilton and Charles Frederick Morehouse. History of the Town of Amherst, Massachusetts. Amherst, Mass. : Press of Carpenter & Morehouse, 1896. 469. Available at the Jones Library or on GoogleBooks. *This list is generated from the Secretary of the Commonwealth website. There may be other local names that are now lost.